Calendar showing only Events with specific Tag (requires add-on) | Calendarize It! Calendarize It! 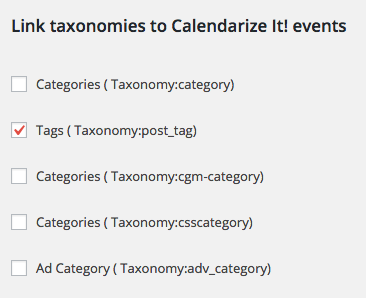 makes it possible for you to display a calendar showing only events from a specific Taxonomy. The Shortcode below will insert the Calendar and only display events from the Post Tag “spartan-race”. You will need to use the Capabilities and Taxonomies add-on and then enable the Tags ( Taxonomy:post_tag) to show in Events. We have also added a “gotodate” parameter as the events we want so show is not in the current month.